Have you ever heard about the bioluminescence animal before? there's some animal in this world who has the ability to emits light from their body. some of this animal could emits light from their body on the dangerous situation or to camouflage theirselves. The terms bioluminescence itself means a production and emission of light by a living organism, Bioluminescence occurs in marine vertebrates and invertebrates, as well as microorganisms and terrestrial animals. Symbiotic organisms carried within larger organisms are also known to bioluminesce. Bioluminescence is a naturally occurring form of chemiluminescence where energy is released by a chemical reaction in the form of light emission. Fireflies, anglerfish, and other creatures produce the chemicals luciferin (a pigment) and luciferase (an enzyme). The luciferin reacts with oxygen to create light. The luciferase acts as a catalyst to speed up the reaction, which is sometimes mediated by cofactors such as calcium ions or ATP. The chemical reaction can occur either inside or outside the cell. In bacteria, the expression of genes related to bioluminescence is controlled by an operon called the Lux operon. In some squid species bacterial bioluminescence is used for counterillumination so the animal matches the overhead environmental light seen from below. In these animals, photoreceptive vesicles have been found that control the contrast of this illumination to create optimal matching. Below was some great list of the amazing animal that can emits light through their body, and they were listed as the bioluminescent animal. Hinea brasiliana is a species of small sea snail in the family Planaxidae. 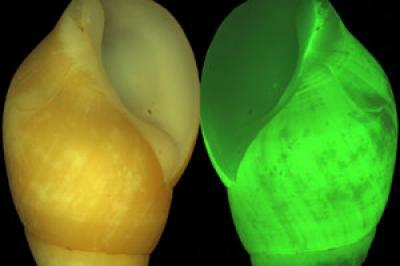 It is one of only a few sea snail species able to bioluminesce, These marine animals can give off light of its shell. a suddenly emitted light can possibly shocks the predators that will attack him so that the snails have time to take shelter in their shell. Scientists discover the new species of squid in the Indian Ocean. The discovery was reported by the International Union for the Conservation of Nature, on Monday (15/11/2010). As for the species included in the family of Chiroteuthid. This Chirotheuthis squid were found to have a length of about 70 cm has an organ capable of emitting light to scare the prey. According to the IUCN, the species is found on the seabed terrain. This might be the most famous bioluminescence animal on the earth. There are over 2,000 species of firefly, which is actually a beetle with wings. 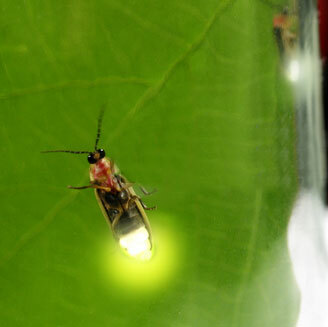 The mechanism of luminous fireflies usually show some information such as their lifetime. Firefly glow even when they are still a small larvae. Wink their pallor, light lime acts as a warning to predators. They generally feed on microscopic plants and tiny marine animals. Some of them catch their prey using a sticky tentacles which is resembling elephant trunk and can move in water like a rope tackle. 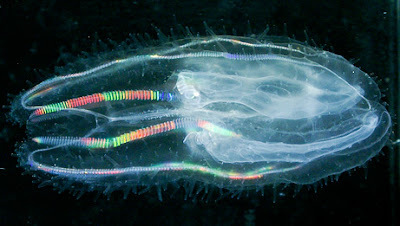 In addition, almost all of comb jellies have special light-producing cells along the back of their bodies are pleated. 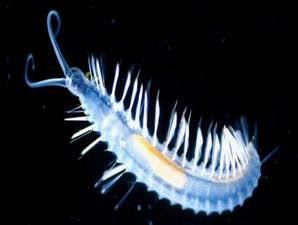 This is a new worms species, found in the depths of the sea this worms has a uniqueness because the body can manifest light. Scientists said it could issue a rare worm " natural bomb " from the glow in her body. Because of its unique ability that the worms get a scientific name Swima bombiviridis. 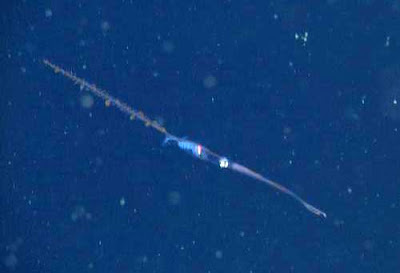 Karen Osborn and his team from the Scripps Institution of Oceanography at the University of California, San Diego, reported finding seven new species of worm in the scientific journal Science. This weirds and ugly fish species was included into one of the bioluminescence animal, Another characteristic is the angler fish light organs on the kind of " fishing lines " at the top of the muzzle. Another type of angler fish, for example Thaumaticthys pagidostomus, have light organs under his teeth. 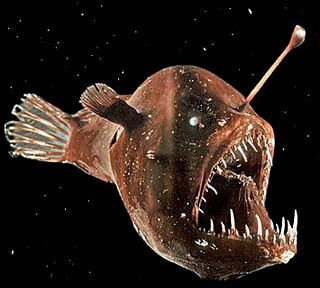 Angler fish has no swim bladder ( due to the depth of the swim bladder or lung humans ) will be destroyed due to underwater pressure, so that the fish had spent his entire life at sea in & never rises to the surface. 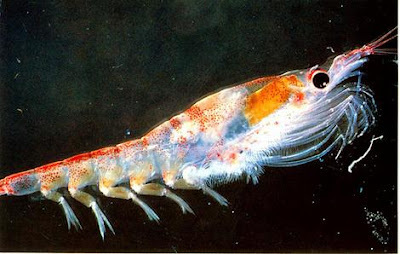 Krill are crustaceans like shrimp that can be found in all oceans of the world. They are eaten by many animals, including birds, whales, squid and whale sharks. They are usually found in large groups, with more than 10,000 krill per cubic meter. The advantages of this krill that they can emit light from their bodies to scare predators. Further Reading about the bioluminescence animals.